Dillon Danis claims he's a better wrestler than Khabib Nurmagomedov. But it would've taken something a lot more than that to draw the UFC lightweight champion out of the Octagon in his finest moment. Khabib retained the belt, he made McGregor - a phenomenon of the sport - look ordinary and he went back for some afters with a 'how do you like me now' taunt. Then, he let McGregor's team have it. His performance stained, his legacy ruined, the sport tarnished further and more fuel to an already burning fire of emotion in the crowd. And all because of Dillon Danis. It's unclear yet just why Nurmagomedov went for Danis but Joe Rogan said he heard McGregor's team mate lobbing insults at him. "Dillon (Danis) was absolutely insulting Khabib, saying something to him and provoking him and then Khabib just jumped over the cage and attacked him. "I couldn't believe my eyes. I thought Khabib was just going to jump to the top of the cage and say 'F you'." But, as the panel discussed whether or not there will be a rematch, Rogan completely dismissed that idea. Not just because the win was emphatic, but because Khabib could face consequences for his actions. "Does the Nevada State allow him to compete again? "Will he be allowed back into the country?" 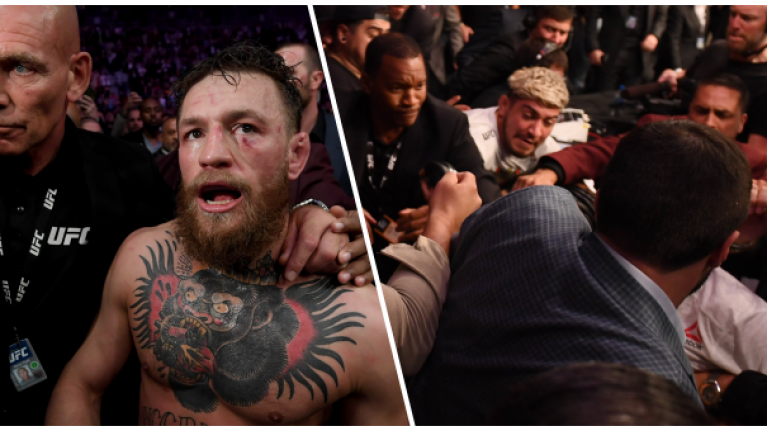 Before the fight, Dillon Danis had started a bit of beef between the two by claiming that he is better than Khabib and, because of that, McGregor would be better prepared.